Two months ago I wrote on a paper that I found in a mid-century engineering journal (Minutes of Proceedings of the Institution of Civil Engineers with Abstracts of the Discussions) on the fantastic mental arithmetician George Parker. When I went to retrieve the volume to look for a different paper (on Fresnel lenses for lighthouses) I flipped the pages to then end of the book to read through the index, and my thumb stopped on a page with a running header, "Mechanical Notations". And lo and behold, the very familiar title was indeed a paper on a report to the Institution on Charles Babbage (1791-1871) and his "mechanical notation", given by his son Henry P. Babbage (1824-1918). Well. Babbage over the years proposed several different difference and analytical engines which indeed could be considered the first stored program Turing-complete computers. Never quite being able to get to the end of one project, and no doubt discovering along his various ways even better and more substantial designs (as well as int he pursuit of future money to build not "version 1.0" or "1.1" but "3.0"), Babbage tried within the limits of available technology to produce his heroic beast. His "mechanical notation" appears in full force in his diagrams for the design of his analytical engine, and it is there that we see his self-derived shorthand and symbols that produced and still-produce evident budgets of unknowns. The thing is, with these mechanical notations, is that they were part of a user manual, and the user manual was actually left unwritten and chiefly unexplained. And that is a problem. In any event this paper by Henry Provost Babbage makes some attempt in outlining the notation, though for me it is done without success. This is further complicated by almost none of the notation presented in illustration. There were other and earlier illustrated papers (including some by Babbage himself) that stretch back at least to 1821--but this explanation of the notations leaves me a little on the outside. And so we moved from the mental calculator George Bidder to the great metallic calculating engines of Charles Babbage, who takes us back to the opening biological/mental part of engineering thought via his manual-less manual, where his instructions and explanations of the interactions of thousands of perfectly manufactured precision gear works is printed but the key to which is left locked in Babbage's head. George Parker Bidder (1806-1878) gave a lecture (without notes) explaining to the audience at the Institution of Civil Engineers in 18561 his interior practices and habits in performing absolutely prodigious and complex arithmetical feats entirely in his head. He was among the first tier of performing human calculators (like Zerah Colburn, b. 1804) mental calculations enchanted large audiences from the stages, answering seemingly impossible questions with accuracy and speed. 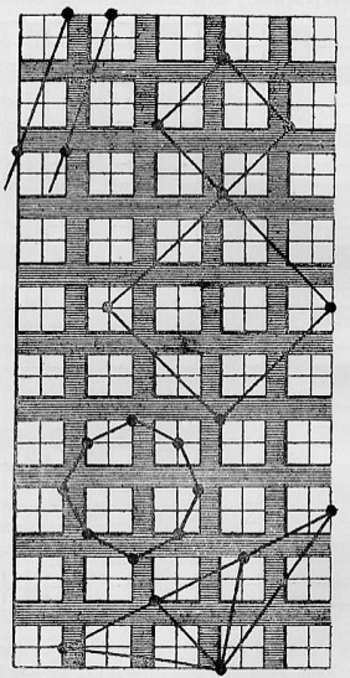 It is in the 1856 paper (which Martin Gardner refers to as "historic2" and "valuable") that he relates some of the practices which clarify his process--for example, one large element was that he would keep one fact in his head at a time, until it was finished, and then move on. Of course for people who did not have anything even remotely resembling this impossible ability, the information is interesting, though I have no idea how useful it may be...unless you were already a savant, that is. Some things are just not to be known by mere mortals. Like the probably-apocryphal story of someone asking Hans Bethe how Richard Feynman had solved--on his feet--some impossible something, and Bethe responds: "First he thinks very very hard....and then he gets the answer".) Something like that. In any event, here's the article, reproduced by Devonshire Perspectives website. My own copy is in a tightly-bound volume from the proceedings, and no doubt I would have broken the spine trying to copy the thing. That said, if anyone wants to buy this volume, it is for sale--this is a book selling site, sorta, after all. Bidder, George Parker. "On Mental Calculation", in Minutes of Proceedings of he Institution of Civil Engineers with Abstracts of the Discussions, volume XV, Session 1855-6, London, published by the Institution, pp 251-280 in the 534pp volume. 2. Gardner, Martin. "Mathematical Games", in Scientific American, 216/4, April 1967, p. 117. Bidder, George Parker, and Institution of Civil Engineers (Great Britain). On Mental Calculation. Edited by Charles Manby. London: Printed by W. Clowes, 1866. Bidder, George Parker. On Mental Calculation. London: Printed by W. Clowes, 1886. I think it would be lovely if--in addition to tablets and laptops--kids in school would be doing work generating chalk dust, and physically moving wooden disks with letters/words on them, and producing that wood-over-metal sound manipulating counting beads on metallic rods. There's just something that goes on in the brain, I think, when you are able to touch something while learning—chalk on a board, fingers on a wooden peg or on pencil to paper, and so on. The pre-nostaligia for that memory is found for me in images like those that follow--beautiful engravings of teaching instruments and tools for elementary schools in France in 1860. The engravings are the work of the prodigiously talented and very busy Caesar Daly, who in addition to writing and editing books also edited the journal Revue Generale de l'Architecture et des Travaux Publics, des architects des ingenieurs des archeologues des Industriels et de Proprietaure, these images coming from volume XVIII, printed in 1860, in the section “etablissements d'instruction primaire”. I just found this unusual image in the page of the scarce journal Illustrated World for June 1919. At first glance it attracted my attention for the design, and then I thought it was utilizing a Sumerian bill of sale--it turns out to be part of an intelligence test. The subject is asked to see how many of the figures pointed out in the top line (and repeated five times) are repeated in the diagram. This is a lot easier than what I thought the test was, which was looking for five-times-in-a-row repeating symbols--after finding a few symbols repeated four times in a row and not five, I read the directions, and the test was much simpler, esp since someone had already gone through and marked out a bunch. The cover story for this month was "electrocuting Whales"--and we don't need to go there. It might have made it more exciting for the readers to know that the fall would've taken about 2.73 seconds from 120'--I think the results are pretty much exactly the same whether the 60mph man was in a car or not so far as the effects of the sudden stop at the bottom goes. In any event, it was an effective way of relating the dangers of ultra-auto-speed in 1932. I came upon a short notice in the Scientific American (January 30, 1892) for Louis-J. Troncet's ingenious and very popular instant-calculator. It was a small and powerful machine (10x6cm) that Troncet had patented in 1889, and was issued in a small book-like folding case, with the accordion folding bit containing multiplication tables. It was quick and easy to use, sold for a few dollars, and became a cheap arithmetic staple for decades. (I'm pretty sure that the image that appeared in Scientific American, above, was the one used in the article by G. Mareschal, “Calculateur mecanique instante,” in La Nature, in 1890 (pp. 307-308). There's a LOT of artistic license in this title, but I like the idea of these acoustical plans as containers of what things sounded like in the halls and auditoriums that no longer exist. This is a big leap of faith given that the work that went into these images was conducted before the first truly scientific/mathematically rigorous architectural acoustics existed. But I like tot think of them as reconstructions of sound in a particular environment. The drawings are also beautiful, inn their way. Image source: Theodore Lachez, Acoustique et Optique des Salles de Reunions, printed in Paris in 1879. This is the second edition, with 116 text illustrations in the 518pp--these are almost entirely images of plans or elevations of music halls (for the study of seating and the room's acoustics, etc.). This edition also contains sections on the acoustics of "sales de debats parlementaires" and an examination of the "singular and curious" acoustics of the new Paris opera house. "...the detailed history of the future, the autobiographies of the archangels, the faithful catalog of the Library, thousands and thousands of false catalogs, the proof of the falsity of those false catalogs, a proof of the falsity of the true catalog, the gnostic gospel of Basilides, the commentary upon that gospel, the true story of your death, the translation of every book into every language . . ."
Here's how you arrange an infinite library: you don't. The books are not sorted to any sort of classification, only collected to the point that they are together. The many seem to be written in indefinable languages. Some of the librarians spent their time pursuing the holy grail--since all books that could ever be published would be present here, which theoretically include an index to library, or some sort of organizing principle. But since there was no verifiable organizing principle at play here, the library was useless as a "library", though for the individual bits, it was perfectly fine. The structure though just turned into a long, endless, shelf. This might explain why the caretaker/librarians of the place are so desperate. I cannot recall a mention of a card catalog, which I guess could be as all-powerfully impossible as the library, given that the library is not-classifiable. This is particularly true when you consider that there must also be a catalog of the arrangement of all possible false catalogs of all possible false books in the library, in addition to the true catalog. Perhaps the cards from this catalog would take up all of the space in the universe that would bump up against our own. "It is interesting, still, that the collection is finite. The entire and ultimate truth about everything is printed in full in that library, after all, insofar as it can be put in words at all. The limited size of each volume is no restriction, for there is always another volume that takes up the tale -- any tale, true or false -- where any other volume leaves off. In seeking the truth we have no way of knowing which volume to pick up nor which to follow it with, but it is all right there." "The ultimate absurdity is now staring us in the face: a universal library of two volumes, one containing a single dot and the other a dash. Persistent repetition and alternation of the two is sufficient, we well know, for spelling out any and every truth. The miracle of the finite but universal library is a mere inflation of the miracle of binary notation: everything worth saying, and everything else as well, can be said with two characters." Quine's approximation cuts way down on the size of the library, which evidently would not fit in the known universe, which opens the gates for Heaven, which I think doesn't depend on such restrictions--unless of course it was too big for that, which means believers would be in trouble, and none too happy with being kicked out of paradise to make space for a book. Nicholas Saunderson (1682-1739) was an extraordinary mathematical talent—he was also blind (from about the age of one), and invented, principally for his own uses, what I think is the first mathematical calculator designed specifically for the use of the blind. He was supremely gifted and creative, and rose to become the fourth Lucasian professor at Cambridge, succeeding the expelled William Whiston, who had in turn succeeded Isaac Newton—Saunderson also held the post for one of the longest periods of time, 1711-1739. HE was friend and associate to Newton, Whiston, Roger Cotes, Halley, De Moivre and others during a particularly rich intellectual period in the history of physics and the maths. His calculator was smart and simple, based on a cribbage-board –like device, that was able to perform arithmetical and algebraic functions—it consisted of nine rows and was worked with two pins, the positioning of the pins on the engraved board telling the user their value. 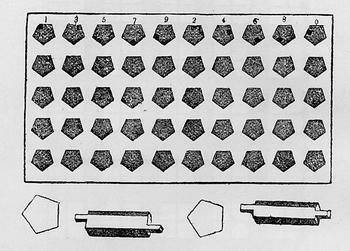 (There was another calculator for the blind constructed by Meyer (below, left) using a sort of reverse principle to the Saunderson model where it was the shape and placement (leaning or not, for example) of the pegs in the hole that annotated value rather than their placement on the board. The Saunderson computer was described in his The Elements of Algebra…,1 published at Cambridge in the first edition just after the author’s death, in 1740. The device was described in the book by John Colson (who succeeded Saunderson to the Lucasian chair), who commented that it was via the use of the device that Saunderson could compose his treatise on algebra. (At right is another Saunderson-based calculator allowing for the construction and study of geometrical figures). There's a box in the studio that is filled with all manner of antique and semi-antique adding/calculating/etc. instruments, from slide rules to blast effects of a nuclear weapon to air speed to the gas mileage for a 1959 Rambler. Some are wood, some metal, but my favorites I think are those made of paper (a large revolving baseball from 1961 for calculating world series records is my favorite in that area....that, or the radiation measurer made of paper to place alongside A Body Part to check on its incremental-or-not growth following nuclear detonation). The there are the little bits that maneuvered the little bits, as seen in this uncovered little gem, the "Fraction of an Inch Adding Machine" (shown above). It was patented in 1952 by K.P. Jaeger (http://www.google.com/patents/USD169941), and is stamped "Sheradco, Inc., Detroit" on the reverse of the metal plate. It does a relatively simple task as stated--adding diverse fractions--and it does so quickly; as a matter of fact, it is far quicker than you can do it online, even with a converter. This is basically two steps--you put a pen or pencil head in the outer ring hole for the first fraction and move the dial clockwise until you come to the stop; then you do the same for the next fraction, and the result is instantly displayed. For operations above 1, you just need to keep track of the whole numbers yourself. Unfortunately it doesn't teach you anything about fractions, but neither does your digital calculator teach you about anything calculating. This is just a smart and pretty instrument that works very nicely indeed, and I just wanted to share it. What Did Sailors in the U.S. Navy Make in 1820? This is one of those fascinating bits that you come across that in the moment are just thrilling, but overall really doesn't have anywhere particular to live in your memory. Still, it was curious to find this data on the positions and pay to the members of the U.S. Navy in 1820 and to see the amount and distribution of pay, and to see the aggregates. The pay ranges (for example) from $100/month for (52) Captains, $50/month for ( 52) surgeons, $40/month for (10) chaplains, $20/month for (21) sailmakers, $18/month for (24) cooks, $12/month for (1388) able seamen, $10/month for 1370 ordinary seamen, and $7/month for (278) boys. So it looks as though the total pay for U.S. naval personnel in 1820 (excluding "rations", which I believe included food and housing allotments) was $867, 578.00 (or pretty close to that) for 4,550 sailors/etc., which is about $200 per year per person, on average. 41% of that total outlay went to the 3,158 able and ordinary seamen, who composed 71% of the total naval force. So it looks like if your removed the pay for "boys" then the highest paid officer made about ten times what the lowest paid seaman made, which by today's standards is pretty corporate-responsible (a la Ben & Jerry's). I'm not yet finding what a carpenter/laborer would make in salary for that year for comparison, but I will add that here later. I've written a number of times on this blog about my interest in collecting the artwork of children--kid art from say before 1900--and how difficult it is to actually find examples. Most of that has been serendipitous, finding scribbles and drawings of notebooks, and ledgers, and free endpapers of schoolbooks, that sort of thing. There are a number of reasons for this scarcity--the greatest being lack of paper, and pencils, or paints; that, coupled with the stuff needing to survive multiple generations of house cleans and moves and so on, well, it just means that not a lot has survived. Lack of paper or paper being too expensive was a big deal, and so kids used slates, which means that very little has survived on the slate itself. And to further point out the ephemeral nature of slate-written/drawn material, I present the slate eraser sponge! It is a little bit of a thing that fits over the slate stylus and allows a really thorough erasure/sponging of anything on your slate. No only was the slate stuff gone, it was double-gone. This is also an invention that is remarkably well nested in the dustbin of abandoned and unnecessary useful inventions that worked superbly for about two decades, and were never heard from again. A Giant's Giant: Fr. Kircher, 1668. The wonderful and occasionally problematic Fr. Athanasius Kircher (addressed numerous times in this blog, just check out a search under his name in the Google box at left) inferred by "anthropomorphic calculus" (so says Jan Bondesman, in A Cabinet of Medical Curiosities, pg 82) the size a human/giant must have been to accommodate (for example) an elephant tooth. So instead of dinosaurs you'd get these enormous creatures many time larger than a "Homo ordinarius"--as you can see in the scale, we have the enormous creature flanked by "homo ordinarius", then Goliath (still puny), "Helvetius Gygas", and "Gygas Mauritanius", all quite tiny compared to the big boy, who stood 200 cubits. (A cubit was a measure from he elbow to the fingertips, so depending on where you were, the cubit could be 17-20 inches or so; in any event the giant would have been 300-400 feet tall.) This image appears in Kircher's great Mundus subterraneus, quo universaw denique naturae divitae, published in 1668. This original image is available for purchase via the blog's bookstore, here. It is always difficult comparing value of objects over periods of time--this is especially so when trying to compare the value of wealth, in general. And so I won't be tempted to much to do this while relating the data of this interesting and tiny handout, The Distribution of Wealth in the United States, 1910. It was published in 1912 by Edward G. Hewitt (who curiously locates himself in "Brooklyn Borough", rather than just "Brooklyn" or the "Borough of Brooklyn", the incorporation taking place 14 years earlier) and presented in a bit of an odd way, at least to me, dividing the wealth into groups of families. It makes it a little hard to understand, even if there are only 22 divisions to the analysis. What attracted my attention in this was the number of millionaire families, which was 7,737 in the total of 18,434,837 families--or about .4%--with an aggregate wealth of $26.9 billion, which was a 22.6% share of the national wealth stated at $115,000,000,000. That millionaires club would be about $24 million in 2014 dollars, using the Bureau of Labor Statistics inflation calculator. Secondly, the much-discussed 1% here totaled 189,237 families with wealth of over $62,500, or about $1,494,545 or so in 2014 dollars. Since "wealth" really isn't defined here it is difficult for me to extrapolate the differences between the 1% of 1910 and the 1% of 2015--especially so since I've seen several different current interpretations of what the modern 1% actually means. In 1910 there were 7,737 families of millionaire status--today there are something like 5.4 million millionaires in the U.S., though that is counted as individuals, or about 1.6% of the population compared to .4% in 1910. And as my friend Jeff Donlan points out, it would be more useful to talk about the 24-millionaires club than simple millionaires, but I don't have access to that data, at least not for this half-hour post. It is interesting that The Economist in 2012 stated that the average household income of the 1% was $1.2m in 2008, according to federal tax data. I find it very surprising that the 1910 1% (adjusted by BLS) comes in at $1.49m. This was a surprise, finding M. Bollee's article ("Sur une nouvelle machine a calculer") in the 1889 Comptes Rendus, pecking around in that big 10-pound volume looking for something else. It was very easy to miss if you weren't looking for it, just a few pages long in a 1000-page book. But there it was, nestled comfortably in pp 737-739. It these few pages Bollee describes his machine and with particular reference to his innovative approach to direct multipilication--a fine addition (ha!) to the long line of contributions by Babbage and Clement, Scheutz, Wiberg and Grant and Hamann. My friend Jeff Donlan (who writes a fine and insightful blog, At the Library) cent (ha!) me this article on the false tyranny of the penny--rather it is about getting rid of the penny, which the author claims has run its course of usefulness, swallowed by the history of economic need for it. Maybe it takes more money to deal with the one-cent piece than it is worth, I don't know--the author of the article goes through that along with a short history of other currencies dumping their minuscule and antiquarian denominations. What I wonder about is what happens to the number "9"? My made-up statistical reference notes that about half of all prices on all the stuff in the U.S. use at least one nine; many use two. What happens to people excitedly advertising ",..and all your's for only three small payments of $19.99!!! And what about gasoline prices which are $2.89 and 9/10? Assuming that we keep the nickel, prices will have to re-adjust to accommodate the five-cent piece, dropping the "9" in millions of prices. No doubt tens of millions of people will think that prices have been raised across-the-board. And what will we do with this enormous surplus of 9s? Seriously though why not just get rid of the whole lot of less-than-a-dollar currency? I know that would be very problematic, but no doubt it there will be less time between the introduction of the penny to its demise than there will be from now to the elimination of all coin-and-paper currency, After all, in for a penny, in for a pound.